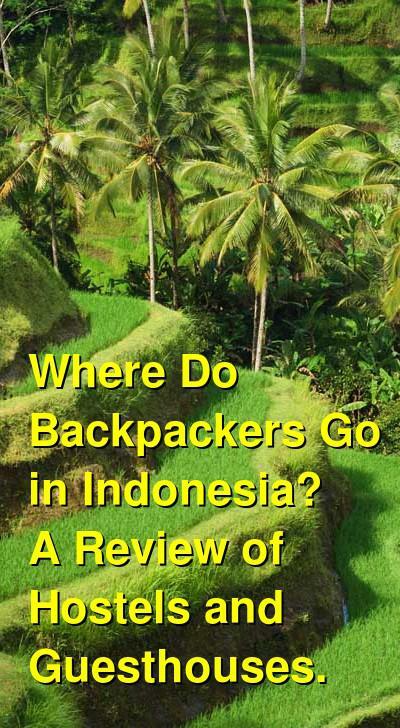 Where Do Backpackers Go in Indonesia? A Review of Hostels and Guesthouses. Most visitors head to the more popular destinations around Bali or Jakarta. In these areas you'll find a wide variety of accommodation types with everything backpacker hostels and guesthouses to high end resorts available. In less popular areas accommodation is often more basic with no air conditioning and shared bathrooms (usually squat toilets). Facilities are required to post a list of prices for rooms. These prices are the most you should pay for your room. It's often possible to negotiate discounts, particularly during the low season. Where Do Backpackers Stay in Bali? If you're looking for nightlife and parties, then these are the places t0 go in Bali. The area has many surfing beaches, bars, and restaurants. It's one of the most popular areas for backpackers who want a cheap and fun beach destination. Legian is a bit more mellow than Kuta, so if you want a laid back environment, skip the parties and head there instead. 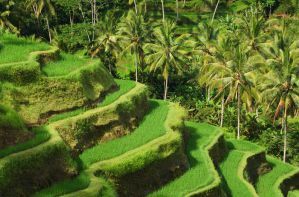 Ubud has an artsy vibe and is surrounded by a lot of natural beauty. The area embraces its Balinese culture and many painters and musicians have made their home here. The area is quite beautiful and makes a great base for exploring the island. Most people who head to this area are looking for high end and luxury accommodation. There are many beach resorts and fancy restaurants in the area, and the beaches have a more secluded vibe. If you're traveling on a budget, there are a couple of options around, but you may have to search harder. Where Do Backpackers Go on the Gili Islands? Gili Trawangan is the party island of the Gili Islands. It's the largest and most developed island of the bunch so there is plenty to see and do. This is also one of the cheapest places in the world to get your scuba diving certification. There are a wide variety of affordable accommodation options on the island. There's everything from hostels to bungalows and guesthouses. Gili Meno is the smallest island of the group. It's also the quietest, and it has some of the best beaches in the area. It's got a romantic atmosphere that is more geared towards couples than budget travelers and many people enjoy honeymooning here. If you want a mellow environment that still has a variety of activities and things to do, then Gili Air offers a good middle ground. There are a variety of dive shops, restaurants, and bars, and some affordable accommodation options to choose from. Where Do Backpackers Stay on Java? Most of the backpacker hostels in Jakarta are in Jalan Jaksa, near Gambir Station and Sarina. There are a decent number of budget, mid-range, and high end places to choose from throughout the city. There is no shortage of budget hotels in Yogyakarta. There is a good concentration of them near Sosrowijayan St and near Malioboro Street, as well as near Prawirotaman Road.